New Zealand 254 (Brendon McCullum 69, BJ Watling 60, Stuart Broad 6-51) and 1-77 (Peter Fulton 41, Monty Panesar 1-13) trail England 465 (Jonathan Trott 121, Nick Compton 100, Matt Prior 82, Bruce Martin 4-130) by 134 runs. England amassed 465 runs in the first innings in 146.5 overs and the Black Caps were bowled out for 254 in 89.2 overs in their first innings followed by 1-77 in the second. The third day’s play came to an end on Saturday, March 16, 2013, at Basin Reserve, Wellington. Earlier, the home side went into the game at 3-66 after playing 33 overs whereas Kane Williamson was batting for 32 while having company of Dean Brownlie who was playing on 8 runs. The batsmen started off briskly and scored 18 runs in the first four overs with 3 fours as Williamson was caught and bowled by Broad for 42 in the 38th over. Brownlie was declared leg before wicket off James Anderson for 18 and the hosts were reeling at 5-89 in 38.2 overs. The skipper of the Kiwis, Brendon McCullum and BJ Watling got together at the crease and tried to take the home side out of trouble. The score board started moving fast with regular boundaries as McCullum added 12 runs in the 44th over with 1 six and 1 four. Watling kept on creeping from the other end and McCullum was the most attacking of the two and completed his 27th Test fifty in the 60th over with a four. Lunch was taken after the next over when the hosts scored 169 runs without losing any further wicket. Brendon McCullum started off from where he left before the break as Watling was dropped at 21by Jonathan Trott at second slip off Anderson. The sixth wicket partnership contributed exactly 100 runs and took the score to 189 when McCullum was gone for 69 off 94 balls with 1 six and 9 fours. Tim Southee went out cheaply for three runs and was replaced by Bruce Martin as Watling took charge of the situation and his bat was sprinkling boundaries regularly. BJ Watling achieved his fourth Test half century in the 80th over and the English skipper, Alastair Cook took the new ball in the next over. The decision paid off in the 84th over as Watling was caught behind by the wicketkeeper Matt Prior off Broad for 60 from 139 deliveries with 9 fours. Bruce Martin remained unbeaten for 21 as the entire home side surrendered for 254 runs after consuming 89.2 overs and conceiving a deficit of 211 runs. 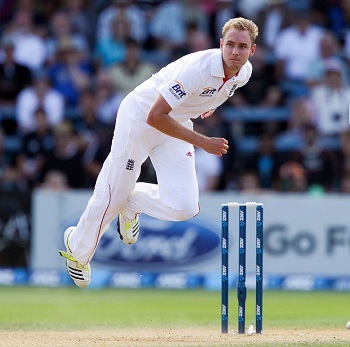 Stuart Broad broke the back of the Kiwis batting by grabbing six wickets whereas James Anderson and Steven Finn shared two wickets each. England forced the follow on and the second innings of New Zealand was opened by Peter Fulton and Hamish Rutherford in a careful manner as they scored just 13 runs in the first eight overs. The batsmen added a couple of fours in the next two overs as Rutherford was caught by Ian Bell off Monty Panesar for 15 at the total of 25 runs. Kane Williamson associated with Fulton next and opened his account with a four. Fulton dispatched the first six of the innings to Panesar in the 15th over as Williamson added 2 fours in the following overs. Fulton hit another 2 fours in the 20th over, stood firm at the crease for 41 and Williamson secured his end at 16 as the Black Caps managed 77 runs for the loss of one wicket in 33 overs. New Zealand faces an uphill task to save the match since they still trail by 134 runs. They have to bat excellently against the destructive bowling attack of England as the result seems obvious in the remaining two days.